Teachers carrying guns. This argument exists in all corners of the internet right now, and now that Florida has passed a gun bill that will allow for as many as 10 teachers in every school to carry a gun, the conversation has become even more important. As the public weighs in on this issue, I hear the argument that schools can't afford pencils and paper, how can they suddenly and miraculously afford to put guns in classrooms? I hear the logistical argument questioning how exactly a teacher with a handgun is supposed to thwart a shooter with a semi-automatic rifle showering the halls with bullets. 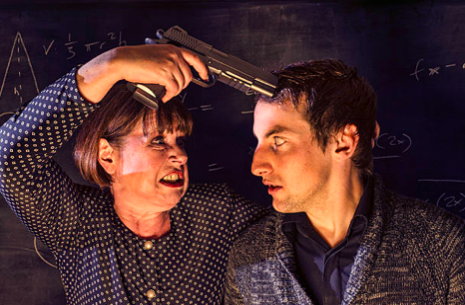 What happens if a student overpowers a teacher and gets the gun? These are all extremely valid concerns, but I have an even greater concern that no one seems to be talking about. While school shootings are more prevalent than they have ever been in the history of this country, on a day-to-day basis, a majority of schools do not experience a school shooting. There is this idea of a sort of teacher-hero rising above and turning into John McClane and outsmarting the shooter and saving the day. But the reality is that on a typical school day, there will be 10 teachers with guns in their classrooms and no bad guys to outsmart. 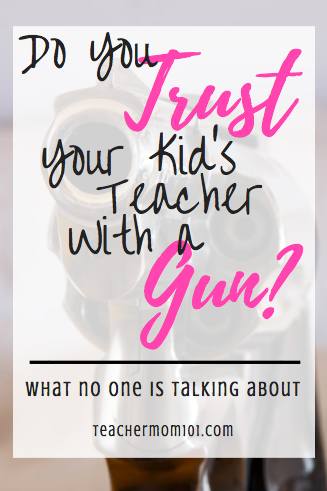 Do you trust your child's teacher with a gun? Teachers are held to a fairly high moral standard, and the public often assumes that all teachers are trustworthy, morally-upstanding people. But every school year we hear stories about teachers having sexual relationships with students, contacting students through social media and exchanging inappropriate photos, and more recently, a teacher in Florida was found to run a white supremacy podcast. Teachers are human beings with the same biases as the general public. Teachers are capable of immoral behavior. And in states like Florida, anyone can become a teacher. All you need to be a teacher in Florida is a 4-year degree and a $75 application fee. This is the standard for many states. Google the requirements for certification in your state - some are significantly more relaxed than others. Do you know the status of your child's teacher's education and experience? I teach at a school that is 99% minority students, mostly hispanic and Haitian refugees. As you can imagine, most of our teachers are white. I have been in conversations where teachers have called students names and referred to students by racial slurs (no students were in the room during these conversations). After the last election, a teacher told my ELL students that she voted for Donald Trump and she was glad that he won because he was going to get rid of all of the bad people who come here from other countries. To a room full of students who had recently come here from other countries. To say that they were devastated is an understatement. Now someone wants to hand these teachers a gun. I'm not suggesting that a teacher is going to shoot a student. I'm suggesting that some teachers are going to threaten students with a gun, and that's almost worse. Our students deserve better than to live under the fear that a teacher who may not like them because of the color of their skin or their country of origin has a gun. My own children have had teachers who treat students so poorly that you have to wonder, why are you a teacher? You hate children! Now that teacher can carry a gun! When you hand teachers guns you are saying that you hold them in higher moral esteem than the general public. This is a mistake. While not every teacher would abuse the power that comes with carrying a gun, some will, and even if that ratio is small, anything above 0% is unacceptable. For those who say that no one is supposed to know which teachers have guns in their classrooms? I promise you, everyone will know. Everyone. will. know. There are no secrets in schools. As the say, absolute power corrupts absolutely, and the act giving teachers guns is going to fall victim to this philosophy. That I can promise you.